How green was our earth! And how fast is 'development' robbing us of the vital forest cover .. The depletion is causing major ecological damage, often completely destroying habitats, uproating peoples and cultures. 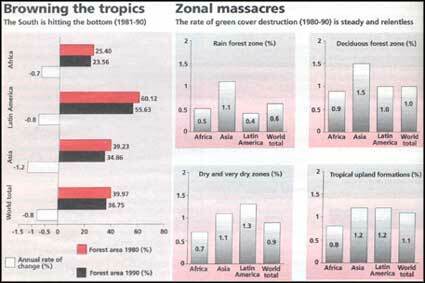 The worst hit is the tropical zone, which houses the Southern nations. Forests are giving way either to developmental projects, industry and housing, or are being replaced by commercial plantations. Latin America has suffered the worst casualties. By 1990, it had lost about 4.5 per cent of what forests it had in 1980. But Asia's is the fastest annual depletion rate of 1.2 per cent. Overall, the world has seen 15.4 million hectare of forests chopped away to serve other purposes. The global annual rate of depletion is 0.8 per cent. And the chop ... chop ... chop of the axes, and the whirr of mechanised saws are articulating the epitaph of humankind.